The Tang Dynasty ruled Ancient China from 618 to 907. During the Tang rule China experienced a time of peace and prosperity that made it one of the most powerful nations in the world. This time period is sometimes referred to as the Golden Age of Ancient China. When the Sui Dynasty began to collapse in 618, an aristocrat named Li Yuan who lived in the north marshaled an army and marched on the capital city of Chang'an. He helped to put a new child emperor on the throne, but Li Yuan really ruled the country as Prime Minister. When the old Emperor Yang was assassinated, Li Yuan then declared himself as emperor and established the Tang Dynasty. Many advancements in the areas of engineering and technology were made during the Tang Dynasty. Perhaps the most important was the invention of woodblock printing. Woodblock printing allowed books to be printed in mass production. This helped to increase literacy and to pass on knowledge throughout the empire. The first full-length book to be printed was the Diamond Sutra in 868. Another major invention of the time was gunpowder. Although it would continue to be perfected over hundreds of years, gunpowder was mostly used for fireworks during the Tang Dynasty. The people believed that fireworks could help to scare off evil spirits. Other inventions included a ceramic called porcelain, advances in mapmaking, gas cylinders for natural gas, advances in medicine, and advancements in clock making. 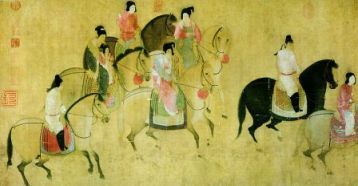 The arts flourished during the Tang Dynasty. It was during this time that poetry became an integral part of the Chinese culture. Poetry was a required study for those who wished to pass the civil service exams. Talented poets were well-respected and often recited their poetry as entertainment at parties. Some of the great poets in Chinese history lived during this time such as Li Bai, Du Fu, Li Po, and Wang Wei. While the Tang Dynasty is most famous for its poetry, other arts also became popular during this time. Many forms of literature were written including short stories, encyclopedias, and histories. Also painting was very popular and the era produced famous painters such as Wu Daozi, Wang Wei (also a famous poet), and Zhou Fang. The Tang Dynasty ruled over a vast area that stretched from Korea to Northern Vietnam. It even reached west as far as Afghanistan. It took a very organized government to control all of this territory. The Tang established a detailed code of laws and administrative functions. They taxed the people based on their land and also required that farmers serve in the army for a period of time. The capital city of the Tang Empire and center of the government was the city of Chang'an. This is the modern day city of Xi'an. It was here that the emperor lived and ruled over his vast empire. Government officials were assigned based on their scores on the civil service examinations. In an effort to get the best talent into the government, examinations were more open to men of the non-noble classes than with previous dynasties. There were even government run schools to help educate more people. Over time, the Tang Dynasty began to weaken due to government corruption and high taxes. A rebellion by the over-taxed people occurred in 874 where much of the city of Chang'an was destroyed. The Tang managed to halt the rebellion, but the government never fully recovered. In 907 the dynasty came to an end when a general named Zhu Wen removed the last Tang emperor and took power. A census taken by the government in 609 showed that there were around 50 million people living in China. The capital city of Chang'an was the largest city in the world at the time. It is estimated that the total population of the city and the countryside around it totaled nearly 2 million people.